We had a great question from one of our Grow Great Fruit members recently about what causes russet on apples, which describes both the yellow marks (as you can see on the side of this Cox’s Orange Pippin apple), and the rough brown marks around the stem end of the apple. Russet is one of those curious conditions that occurs naturally – in fact several heritage apple varieties include it in their name, like Brownlees Russet, Egremont Russet and Old Somerset Russet. It’s also commonly seen on pear varieties such as Beurre Bosc. These days, russet is not considered an attractive trait on apples (have you even seen a russeted apple in the supermarket? ), and it’s just one of the reasons many of these beautiful old varieties have gone out of favour (which is one of the reasons we’ve planted a new heritage apple orchard to preserve many of these old varieties). 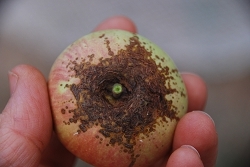 Russet can also be an injury caused by environmental conditions like frost, sunburn, or hail, or by spraying your apples at the wrong time – even using sulphur (which is an organic fungicide we use occasionally) at the wrong time can cause russeting on some apples (as can a lot of the chemicals used by chemical farmers). This damage-type russet – think of it like scar tissue – usually happens in the three weeks after petal fall, when the trees are flowering, or when the environmental challenge happens. 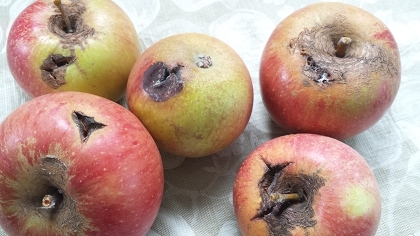 It is often not a problem in itself, but it can make the apples much more vulnerable to other diseases, like various fungal rots, cracking, or even sunburn. 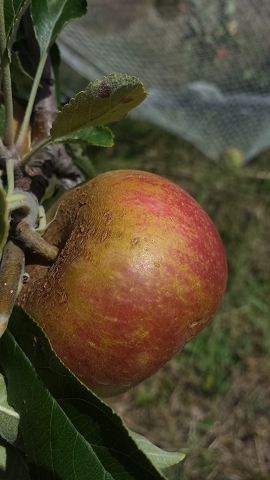 Heritage varieties that were bred in the UK, such as the divine Cox’s Orange Pippin apples (above) or the much-loved Bramley (below), are really not suited to the harsh and hot conditions in Australia, and so it’s very common to see this type of damage on your apples. Of course once you realise that, you can set about creating micro-climates that these trees will prefer, and you may find that much of the damage is preventable. You can find out more about creating micro-climates in your garden in Permaculture in Action. Next Next post: Why do you dream of growing your own?